J.McBreesy -- A.Hatfield -- His Father -- Mr Tate. George was educated at Wirksworth Grammar School (now Anthony Gell School). When he left school, George Hatfield was apprenticed to salesmanship at Chesterfield and became a traveller. At the time of the 1871 census he was working with his father as a Tailor. 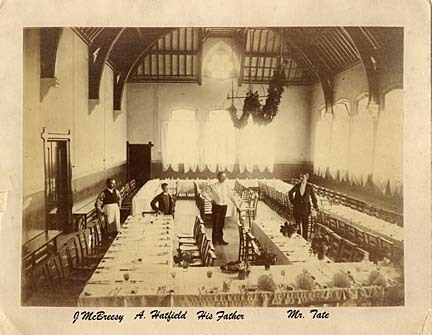 When his father retired, Halls of Wirksworth asked him to travel for them; this he did for a few years but later he became the landlord of the George Hotel in Coldwell Street. He died from a stroke in June 1912 at the age of 60. The burial records in Wirksworth Town Hall describe him as "a tailor and caretaker of the Town Hall, late of St Mary's Gate". He was buried in Wirksworth Cemetery. After his death his wife Catherine, and their daughter Frances, kept a shop** at St Mary's Gate. Catherine Hatfield died in Wirksworth in 1924 aged 75 years. Four of George and Catherine's children* ware baptised at the Parish Church on the same day - 21 November 1883. ** known as the "tuck shop" for Wirksworth Grammar School.